This fancy costume is being used by a rider in the Tokugawa Ieyasu Parade in Japan, part of a festival to celebrate a famous shogun by that name. I wish we could see more of the woven and fringed red breast and rump ornaments on the horse. I may be wrong, but the rider appears to have a stiff protective covering on his lower leg - a sort of shin guard. 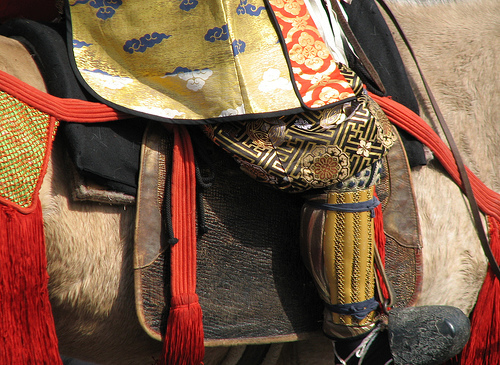 The stirrups are shoe-shaped, enclosing the whole front of the rider's foot.